Mod Lounger (MODLOUNGE) at Pure Design / Seating / Outdoor ::: Furniture for the Home, Office, Home Office, and More at Pure Design Online! The Mod Lounger brings together Offi and Lisa Albin's shared sensibility for innovative design that articulates the product's function in its form and expresses a fun approach to everyday objects. With this collaboration, the bent ply Mod Rocker was reinterpreted within the entirely different manufacturing capability of rotational molded plastic, and thus we were able to further develop the expressive and sculptural nature of the design. The Mod Lounger can be enjoyed by all ages, as a cozy spot for adult and child or for two kids together! 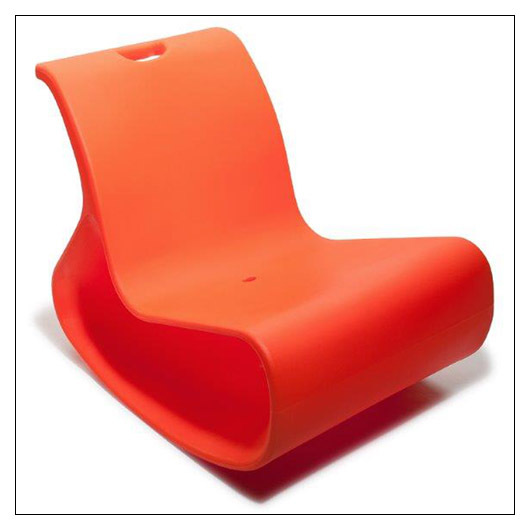 Enjoy the Mod Lounger in your cool hang out space, at the library... or by the pool! Design Milk thinks the Mod Lounger is going to be a winner.